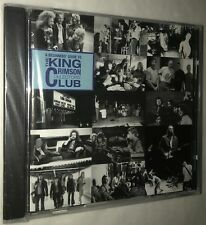 A Beginners' Guide to The KING CRIMSON Collectors' Club CD - NEW SEALED! This is a collection of songs pulled from the first 10 King Crimson Collector's Club releases which was a series that was originally only available by subscription. There's one song from each release and it's pretty well chosen. CD, booklet, insert and jewel case are all in excellent condition! I have play tested the CD and it sounds great! The disk is excellent. The case is near mint. We use foam or bubble wrap. Free parking and free admission. ADRIAN BELEW Love Rhino & Twang Bar King RARE OUT OF PRINT DELUXE 2on1 REMASTERED IMPORT CD. Great collection from THE BEARS & KING CRIMSON vet. Twang Bar King. The Lone Rhinoceros. OOP = OUT OF PRINT. JOHN WETTON KING'S ROAD 1972 - 1980 CD RARE ASIA PROG ROCK KING CRIMSON. Condition is Like New. Shipped with USPS Media Mail. IT FEATURED A SPECIAL PRESENTATION OF GREG LAKE AND KING CRIMSON LIVE IN CONCERT. GREG LAKE WAS RECORDED IN LONDON, NOVEMBER 5, 1981 AND KING CRIMSON LIVE IN MONTREAL CANADA IN 1974. And every one you buy is an original, not a copy, not a remake - all are limited editions in the hundreds at most and most, like this special show, much less. King Crimson - The Deception Of The Thrush (CD) (Compilation). Condition is Brand New. Shipped with USPS Media Mail. Cover is good, disc is very clean. RARE 4 CD Premiata Forneria Marconi (Russian limited editio n). L'Isola Di Niente (Matrix: 501006610831-01-01). JET LAG (CD-R/Limited Progressive Italy ). 1 RARE OUT OF PRINT CD. The KING CRIMSON & BEARS vet on a stunning tour-de-force. OOP = OUT OF PRINT. Piano Recital. Piano Ballet. Seven E Flat Elephants Eating. This is a format in CD mastering that improves on sound quality and adds to the band width available. King Crimson ‎–A Beginners' Guide To The King Crimson Collectors' Club. Series: The King Crimson Collectors' Club –. 1 –King Crimson 21st Century Schizoid Man (Live In Central Park, NYC 1974). 5 –King Crimson The Sailor's Tale (Live At Summit Studios, Denver 1972). In the Court of the Crimson King debut 40 Anniversary Edition 2CD version / King Crimson. This work is the current of 2004 master and 2009 Steven Wilson (Porcupine Tree) and Robert Fripp remaster · CD2 Disc Edition of Li master version of "In the Court of the Crimson King". Sunshine In The Night 4:34. CD in mint/near mint condition in jewelcase. Roll With It 5:47. There Goes My Heart Again 4:29. Feelin' Loose 4:49. Sunshine In The Night 4:34. CD in mint/near mint condition in jewelcase. A Little Help From You 3:38. Roll With It 5:47. There Goes My Heart Again 4:29. Feelin' Loose 4:49. For sale is this great music cd. Premium Information Services Ltd.
Every line-up of the band is featured across the 2CD set. King Crimson. In the Court Of The Crimson King recording sessions. In The Wake Of Poseidon recording sessions. From 21st Century Guide To King Crimson boxset. Artist: GORDON HASKELL. Title: HARRY'S BAR. Label: EAST WEST. Year: 2002. GORDON HASKELL - Harry's Bar. This is one of 10000 CD's, LP's, 12” and 7" that I HAVE COLLECTED OVER THE LAST 30 YEARS; they run from the 1950's to the 2000's and cover every style of music. 7 CD KAIPA (Russian Edition) Kaipa (Matrix: FCCD 200346-2 ifpi 093);. Notes From The Past (Matrix: KAIPA);. Ignet Nytt Under Solen (Matrix: FCCD 200347-2 ifpi 093);. SOLO (Matrix: CDR UG 80E);. Mindrevolutions (Matrix: GP-05 GT 000232);. But with later releases, EMI/Virgin stopped doing the picture discs for the CDs inside the sets, but still calling them 'Collectors' Series'. This is a fun series to collect, as Virgin Records had a killer roster back in the 70s and 80s. (A few very light scratches but disc plays perfect :). Sunshine In The Night 2:47. IN EXCELLENT CONDITION. A Little Help From You 3:38. CHECK OUT 11LES11 FOR A FEW SURPRISES! HARD TO FIND. Feelin' Loose 4:48. When will my order arrive?. Trending at $2.68eBay determines this price through a machine learned model of the product's sale prices within the last 90 days. KING CRIMSON 21ST CENTURY GUIDE. COMPLETE 4-CD/BOOK/BOX SET OF VOL 2 1981-2003. 2018 UK 'Uncut' promo Compilation CD album. 'SONIC TRUTH'. KING CRIMSON: COMPLETE 21ST CENTURY GUIDE TO VOL 1 & 2 8-CD/BOOKS/CASES/BOX SET! ALL OF OBI IN MY COLLECTION ARE ORIGINAL, INCLUDING NO FAKE OBI ! ARTIST - GENTLE GIANT. ORIGINAL OBI -EX. VERY GOOD ( /-) = Many superficial markings on disk, or moderate wear to the inserts or OBI strip. Sunshine In The Night 4:34. CD in very good condition in jewelcase. Jewelcase may have stickers (see scans) and may be worn/marked consistent with age and storage. A Little Help From You 3:38. Roll With It 5:47. Artist: GORDON HASKELL. Title: HARRY'S BAR. Label: EAST WEST. Country: GERMANY. Year: 2002.